Remodelista recently ran a new feature on the Timber Cove Resort, fully remodeled and reopened in 2016. The first phase of the Roche+Roche designed landscape included the outdoor living room with hanging swing seating, custom built-in banquettes, infrared soffit heaters, outdoor billiards and table tennis. 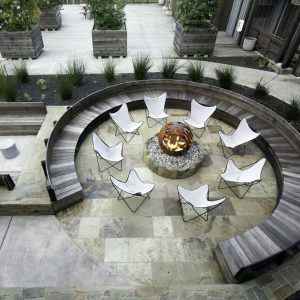 The circular banquette seating creates an outdoor room focused on the custom fire-sphere whose dove cutouts echo the tile mosaic designs on the nearby 93’ tall ‘Madonna of Peace’ sculpture by Beniamino Bufano (http://www.calexplornia.com/bufano-peace-statue-monument/).